Profound deliciousness lies in the midst of the season’s scarce pickings. A winter’s kitchen repertoire is like a closet full of thick warm woolen sweaters, each a different color and each knit by a separate hand. Winter is a time to prepare comfy foods that nourish the soul as well provide everything we need to keep us warm. In the French kitchen, the leek plays a supporting role all year round, but is by far the star of the show during the dark winter months. In winter, the leeks are often new, small and thin, the kind I like best, because they are bursting with life out to their skin, and the flavor goes such a long way. Leeks are an important part of the petit salé, the pot au feu, and many other long cooked soups and winter ragouts, and perfect in combination with potatoes in a velouté we call the Vichyssoise. One of the best and easiest ways to enjoy fresh young hardy winter leeks fresh from the producer’s garden aside from eating them plain, is to make a petite tarte aux poireaux. Prepare one batch of your favorite Pâte Brisée recipe, and prebake a small tarte shell. - Wash and dry the herbs. Remove the chervil leaves from their stems. You are going to have between 1/2 and 1 cup of leaves. Roll and slice the sorrel into a fine chiffonade, which is thin strips made by slicing across the roll you have made. - Cut the end from each leek, and remove the outer leaves only if necessary. Wash them well, without taking them apart. There may be areas near where the green shoots form where sand or dirt have accumulated. This is rare for the fresh young leeks, but be careful and ensure that it is all removed. Slice the whites into very thin rounds, and keep slicing a little way up into the green stem, to give the mix a little color. (Leave the remaining green part in your collection of scraps and cuts to be used later for a vegetable stock.) Mince the onions and shallot. - Sauté the onions, leek, and shallot in the butter over low heat, pushing them about with a wooden spoon, until they soften (this is called faire fondre, to melt, in French). You don’t want to have too much caramelization. Use your judgement and once the roots are soft and tender, and not browned very much at all, add the herbs and push them about until they wilt but not so long that the sorrel begins to change color from bright green to drab. 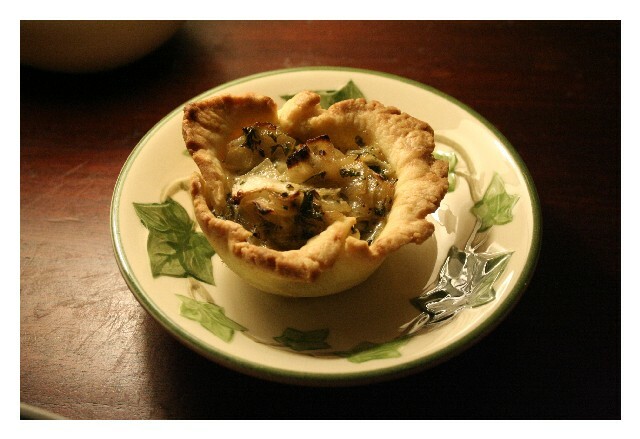 Turn the melted bulb / herb mixture into the prepared pastry shell and spread it all over the bottom. Remember, a little leek goes a long way in flavor. - Stir up the crème fraîche and add a little water if necessary to get it to the consistency that it can pour. It should still be quite thick. Drizzle the crème fraîche over the whole surface. Return the tarte in which you have placed the melted roots and crème to the oven, and bake for another 10 minutes. Serve this tarte warm, hot, or even cold. This recipe does very well as little bite sized aperetif tartelettes. The photo above is a portion-sized tartlette which was done without pre-baking the shell. It is nice to serve this is as an appetizer, or what the French call an entrée. A variation of this tarte is to grace the top with slices of fresh goat cheese and a generous grind of white pepper before baking. This marries very well with the sorrel and chervil. Be sure to note your variations in your kitchen notebook, because they'll serve you well in the future. Oh yum! My mouth is watering it looks so good. I love leeks, too, and as soon as Winter arrives my husband asks me to make leek and potato soup, served hot with a spoonful of cream swirled into it, and warm crusty bread.